AFSC is shining a spotlight on the excessive influence of powerful corporations through a strategic education and action project on ‘Governing Under the Influence’ (GUI). The project is starting in Iowa and New Hampshire, the two states that get the lion’s share of attention from presidential candidates. The project focuses on the idea that we need to ask our representatives tough questions about humane alternatives to current militarized policies; alternatives that bring about shared security for all rather than selective protection of some. These questions become particularly pertinent when thinking about immigration policies and defense contracts. See this interactive showcase based on Fusion’s investigation, which found that without a single vote in Congress, officials across three administrations created a new classification of federal prisons only for immigrants, decided that private companies would run the facilities, and filled them by changing immigration enforcement practices. Is increasing militarization at home and abroad really furthering the security of individuals and communities- either in the US or outside? 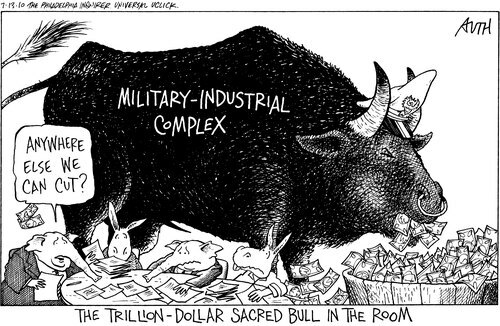 Or is it merely bolstering the security of the state apparatus – what Eisenhower presciently referred to as the Military-Industrial Complex? A recent study found that foreign intervention is 100 times more likely in oil-rich states. The research frames oil as a dominant motivating factor in conflicts, and argues that hydrocarbons heavily influenced the West’s military intervention in Libya. It also suggests that oil plays a noteworthy factor in the US-led war against Islamic State. This entry was posted in Shared Security Roundup and tagged Demilitarize Us, foreign intervention, government under influence, immigration, libya oil, mass incarceration, militarization, military industrial complex, obama in india, shadow prisons, us immigration policy. Bookmark the permalink.